LAS VEGAS (AP) — A day after Las Vegas marked the anniversary of a mass shooting that killed 58 people, former U.S. Rep. Gabby Giffords sought to rally gun violence survivors, Democratic candidates and activists Tuesday in a push to register young voters and elect candidates who back gun control. 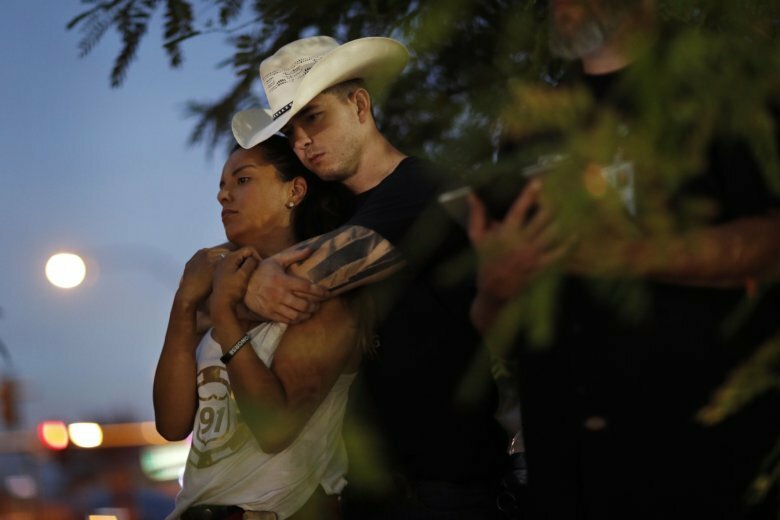 Monday’s anniversary of the Oct. 1, 2017, attack at a country music festival, along with a gun violence round table and a voter mobilization event Tuesday, revived a debate on guns in Nevada, where voters have divided attitudes toward firearms. Giffords, an Arizona Democrat who was gravely wounded in a 2011 shooting at a constituent gathering in Tucson, has founded a gun safety organization and a political operation focused on challenging incumbents, including Nevada Republican Sen. Dean Heller, who is in a tight re-election battle. “It’s time to stand up for what’s right. It’s time for courage. We must do something. We must stop gun violence,” Giffords said. Heller’s Democratic challenger, freshman U.S. Rep. Jacky Rosen, joined Giffords and other Democratic House candidates including Susie Lee, former Rep. Steven Horsford, and Rep. Dina Titus. Giffords’ husband Mark Kelly, who noted he’s a gun owner and veteran, acknowledged guns are complicated issue that he and his wife have been tackling for years. Guns are part of Nevada’s western lifestyle and tradition, but the increasingly progressive electorate has been pushing for changes to gun laws, particularly in the wake of the Las Vegas shooting, which was the deadliest in modern U.S. history. Chris Davis, whose daughter Neysa Tonks was killed in the Las Vegas shooting, said Tuesday that he attended the round table to learn how the candidates plan to vote and what they’ll do about gun violence. Davis said he was encouraged to hear pledges to work on background checks and more gun legislation. Heller — and every other member of Nevada’s congressional delegation — were conspicuously absent from a televised huddle President Donald Trump held in March with lawmakers from states that have been touched by gun violence. Trump and Heller, who has been endorsed by the National Rifle Association, did not mention the shooting at a Las Vegas rally two weeks ago held only a few miles away from the shooting scene. Heller’s campaign spokesman Keith Schipper said Tuesday that Rosen “is nothing more than a campaign commercial” when it comes to addressing gun violence. “If she spent half as much time working on legislation as she does talking about it, maybe she’d actually accomplish something,” Schipper said. Rosen has sponsored bills that would limit high-capacity magazines and expand background checks, and her office has touted her efforts to amend a defense bill signed by the president this year to include language making it tougher for military members convicted of domestic abuse from purchasing firearms. Heller’s campaign has noted he signed on as a sponsor of measures signed by Trump in March to bolster school safety funds and improve compliance with the criminal background check system for firearm purchases. Heller’s office noted he raised the issue of bump stocks with Trump last week. The Justice Department is finalizing a rule to rewrite federal regulations on the devices, though some officials contend Congress will still need to change the law. Though Nevada politicians on both sides of the aisle have focused their campaigns more on issues like immigration, health care and Trump, other political organizations and activists are spending money and time in Nevada to elevate the gun issue. California billionaire Tom Steyer, who is spending $ 2million in Nevada to defeat Heller and Republican gubernatorial candidate Adam Laxalt, joined Giffords and Kelly later Tuesday for a voter canvassing event at the University of Nevada, Las Vegas as part of his NextGen America’s efforts to engage with young voters. Giffords and Kelly have unsuccessfully pushed Congress to enact gun control measures for years and have since shifted their focus to state legislatures. Giffords’ group said earlier this year it planned to build on the student activism coming out of the Parkland, Florida, school shooting and engage young voters.